Well, today's the release day for one really awesome book that I read a little while ago and have been absolutely dying to tell you all about! 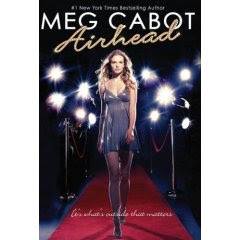 So without further ado, allow me to present Airhead, by Meg Cabot. Emerson Watts is not pleased when her mother forces her to take her celeb obsessed younger sister Frida to the grand opening of the Stark Megastore. She'd much rather stay home and read or play video games with her best friend Christopher. But when she's involved in a peculiar accident, Em finds that her life is changed forever. Soon she's living a completely different life, and is being watched on all sides, by friendly and not so friendly allies. For those of you who have longed for a novel that is right up there next to Cabot's Mediator series, this would be it! Airhead exemplifies Cabot's trademark of writing inimitable and one of a kind plot lines, but rather than come across as unbelievable, her grounded, witty, and sharp characters make this fast paced novel plausible. Although more elaboration on certain characters before Em's accident would give them more depth, Cabot's fresh twist on the modeling world and carefully constructed dialogue make this book appealing to all. It spectacularly transcends the boundaries of teen genre, combining contemporary fiction, romance, humor, and science fiction to weave together an impressive first novel of what will assuredly be a breathtaking and brilliant trilogy. Great review! Mine will be up later this week or next week. I really loved it too! Lol, I am going to be posting my review of this book soon!! I am also having a contest at my blog if any of you are interested in entering! head over to www.reviewabook123.blogspot.com for details or email me at dogsrule.1@hotmail.com for details!!! Great blog!